This article discusses the fields and functions included in the Team Members overlay, accessed by clicking the circled plus icon in the upper righthand of the Sandbox. 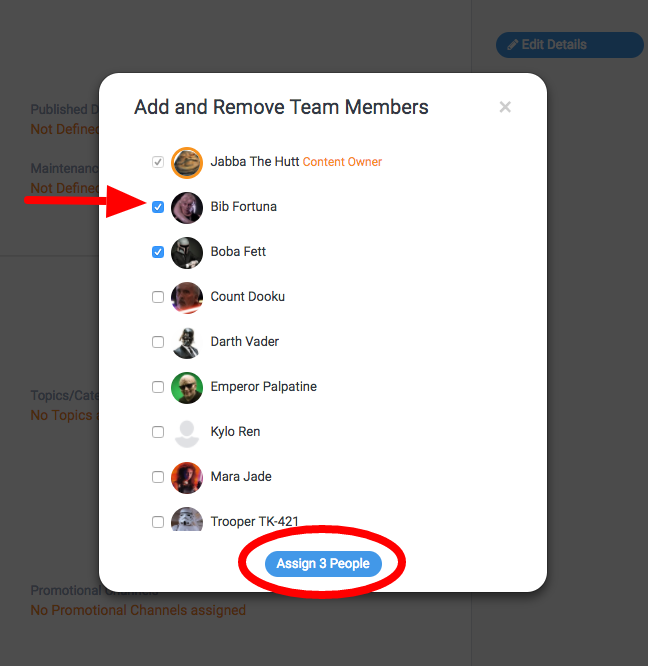 The Team Members overlay allows you to assign your content item to various members on your team. The list of users that you see are those people who have been given access to the calendar that was selected previously (Key Details section). So, if you're trying to assign this content item to a certain person and they aren't included in the list, you might need to check their calendar access. Content Owner - (labeled as such in orange) Each content item must have a single content owner, which should be the person ultimately responsible for producing this content item, or managing the production process. Assigned To - Check the box for each team member who should be included in your production, review or approval process. Assigned team members will then receive recent activity and/or email notifications when updates are made to this content item.